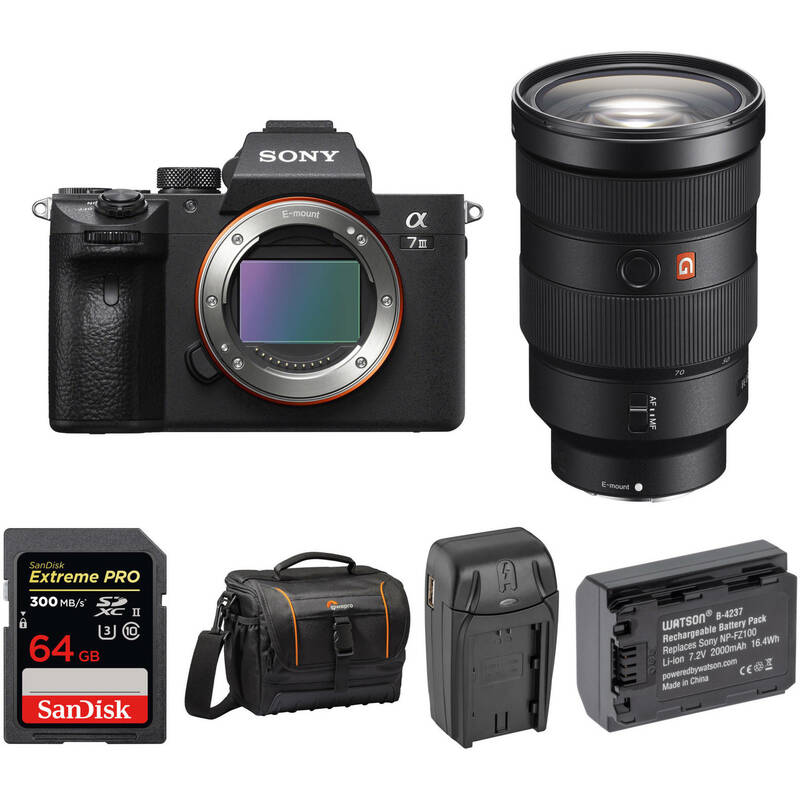 A solid foundation from which to build your camera system, the Sony Alpha a7 III Mirrorless Digital Camera with 24-70mm f/2.8 Lens Professional Kit from B&H bundles the mirrorless body and standard zoom lens with a memory card and a protective camera bag. A fast, standard zoom favored for its versatility, the Sony FE 24-70mm f/2.8 GM is a wide-angle to short telephoto lens designed for E-mount mirrorless cameras. Featuring a constant f/2.8 maximum aperture, this lens maintains consistent performance throughout the zoom range and benefits working in low-light conditions and with selective focus techniques. Complementing the apt light-gathering capabilities is an equally impressive optical design, which incorporates three aspherical elements and two extra-low dispersion elements. One of the aspherical elements features an XA (extreme aspherical) designation, ensuring its refined surface precision and notable ability to minimize spherical aberrations throughout the zoom range. Additionally, a Nano AR Coating has been applied to individual elements to significantly minimize lens flare and ghosting for increased contrast and color neutrality. Pairing a sophisticated optical design and versatile speed, this standard zoom is well-suited for use in a wide array of environments and lighting conditions. One extra-low dispersion element and one Super ED element are featured in the lens design and help to control chromatic aberrations and reduce color fringing for increased clarity and color fidelity. A Direct Drive Super Sonic wave AF motor and internal focus mechanism provide quick, quiet, and precise autofocus performance and also contribute to more natural, intuitive manual focus control. A focus hold button and AF/MF switch are present on the lens barrel for intuitive tactile control and rapid access to select settings. Alpha a7 III Mirrorless Digital Camera with 24-70mm f/2.8 Lens Professional Kit is rated 4.6 out of 5 by 406. Rated 5 out of 5 by John from Best All-Around Camera This Sony a7III is actually my second Sony mirrorless camera. I bought the a7rIII a few month ago. Although my a7rIII produces higher resolution photos, I'm not too fond of the file size of the 42MP. Unless you have all the latest card readers and computer system, the files from the a7rIII can slow down your workflow not to mention the extra storage space you would need. This a7III is the perfect for that. The operation is practically identical to the a7rIII, and the images are sharp. It's a perfect everyday camera. I've noticed that the evf is not as crisp as the a7rIII, but hey, you save over a grant, so no complain there. Rated 5 out of 5 by Kevin B. from Ignore Silly "No Battery Charger" Reviews Seriously, You'll give a camera a one star review because it doesn't have an external battery charger? ?Big deal, buy one. I go out with two charged batteries and after shooting for many hours haven't touched the second one yet. ?When I get home I charge the one I used. ?This is an outstanding hybrid camera that excels at both video and stills for $2K. ?You can't find a camera at this price point or even higher that comes close. ?It's not perfect, but for what it is, close. Sony continues to listen to its customers and continues to improve the product. ?Am I Sony fanboy? ?No, I am a fan of the leaps and bounds Sony is making with mirrorless ILC's. Rated 5 out of 5 by MICHELLE from Best hybrid camera - well at least for 2018 I had the GH4 in 2014 for the 4K but the AF and low-light bothered me so I got the a6300 in 2015; loved that so I got the a6500 and waited for the GH5 which was disappointing so I waited for the a7III.? First day of sales the body only? were sold out but the kit lens + body were available for $200 so I snapped it up and got it two days later.?? Excellent camera.? I didn't expect the colors to be better than the a6500 but it is so good to the point that I'm considering getting a second a7iii.? I haven't used the kit lens yet but only with the Zeiss 55f1.8 which is phenomenal.? A corporate client raved about the 4K video with this combo as being Hollywoodesque. Rated 5 out of 5 by CM from Huge upgrade from Canon 70D Jumped on the Sony train after years of Canon APS-C bodies. I always wanted to move to a full frame camera and was so excited when Sony announced this (was hoping 6D mkii would be more impressive so I could save my glass). I ordered as soon as I could and am not disappointed! The image quality is astounding. My favorite things about the camera: nails focus every single time, low light performance is incredible compared to what I was used to, 4k video is incredibly sharp, 120 fps slo mo is awesome.? Only thing I really miss is the fully articulating screen like on my 70D. Oh well, I will make the trade for the astounding image quality. Rated 5 out of 5 by Tanya from Amazing product. Love it. This is the fist camera body I've reviewed. I have owned Nikon & Canon cameras, then switched to SONY when we heard of the a7iii release. My fiance and I purchased 2 of them, and the last two weddings we have shot with this camera just made life a lot easier for us. We have tested the battery life on a 12 hour day (which was our primary concern with switching to SONY), and it did the job with just two batteries hybrid shooting both video and stills. We paired these cameras with some Zeiss and Rokinon glass, and we're blown away by both the autofocus performance as well as its low light capabilities. Hands down rock solid product, and highly recommend for anyone looking to do professional work with the SONY systems. Rated 5 out of 5 by Bill from From Canon to Sony I upgraded from a Canon 7D to the Sony a7 III and I absolutely love it! It's a full frame, mirrorless camera in a small package at a great price! I'm planning on capturing a lot more video and the auto-focus and image quality are really outstanding. I also purchased the FE 24-105mm G f/4, the 16-35mm G-Master f/2.8, and the 55mm Zeiss f/1.8. These lenses are pricier than those I've previously purchased for my Canon, but smaller and of decent quality. I ended up with the kit 28-70mm kit lens because it was in stock before the body-only or other kits, but I really like it's small size and versatility. Definitely worth the $200. A really awesome DSLR kit for $2200 even if you don't purchase additional lenses. Rated 5 out of 5 by Thomas from Huge step forward Ive been using the original A7 as my main camera (mostly for video.) It still gives me some nice images under ideal shooting conditions, but if the light is off or quick focus is required it is definitely showing it’s age. This new camera has been mind blowing in it’s quick focus, improvements to ergonomics, and ability to shoot in low light that rivals the A7Sii. Almost every frustration I had with my A7 has been addressed in this camera, with the bonus of other huge improvements I hadn’t thought of. Stunning low light performance. I was thinking of waiting for the upcoming 7s update ( which might have 10 bit recording), but I have no regrets buying this camera. Love it. Does the a73 have silent shutter? Yes, the a73 does have a silent shutter option by enabling the electronic shutter. Can the assisted magnification and autofocus features still functions work using non-Sony vintage lenses? I use vintage lenses with my Sony A7rii and I'm still able to use the 10x magnification feature. I rented an a7iii and wasn't able to do it, but I'm not yet familiar with the A7iii's full functionality. Is it possible to use the magnification and autofocus features with other lenses? Does this camera package come with any warranty? As indicated under the &quot;In The Box&quot; section under the Overview tab on our website, the Sony Alpha a7 III Mirrorless Digital Camera (Body Only), B&amp;H # SOA73, comes with Sony's standard Limited 1-Year Warranty, which is valid for use in the United States only. Are digital zoom and/or clear image zoom available during 120fps? I live in a caribbean coastal city (Barranquilla) with humidity and apron 30-35C all year. For video, I need to do interviews on the outside in the sun, maybe shade, still very hot. Ive read a lot that Sony's Alpha 7 line are poorly weather sealed and water and corrosion is usual. My Canon 7D take time to overheats but still happened, but buying a new camera is to overcome this. I wanted to upgrade to the A7III, but there are mixed reviews, some saying it won't stand more than 8 mins 4k video in sun 32 aprox and that corrosion is very common. Is this camera good for outside video with tough conditions? I would say that from what I am seeing and hearing, the Sony a7 III is the most heat and weather resistant of all the a7 cameras Sony has ever made. Therefore if you have this camera, when you are shooting in extreme conditions you have to consider best practices. You can't expect the camera to work flawlessly all by itself without protection. This has been true ever since the first camera took a picture. Keep the camera cool in the car, keep a white towel over it, use an umbrella, use an external recorder/monitor, use an external power supply, keep the battery door open while shooting interiors, and keep the rear screen away from the body. If that is not enough, you might consider a camera with a smaller sensor like the Panasonice GH5s. Tracking Birds in flight how does it do compared with a Nikon D500? With a Sony G lens, the a7 III will be as good if not better than the Nikon D500. If you put a third party lens on, the performance will lag in comparison. It will be good, just not sterling. Hi Long, the camera does not come with an external battery charger but with an AC adapter allowing you to charge the battery in-camera.